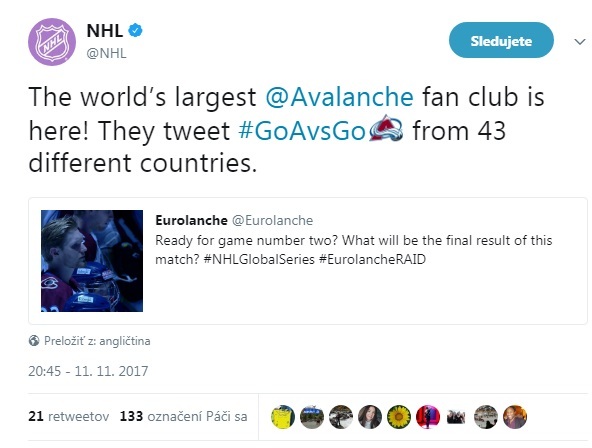 Eurolanche Fan Club did an interview with the newest member of the Colorado Avalanche first team´s roster. Maxim Noreau signed two-year one-way contract for 1 250 000 USD with the Colorado Avalanche. This 27-year old defenseman has never been drafted by an NHL team. He signed entry level contract with the Minnesota Wild in 2008, but played only in 6 NHL games during the following three years. He mainly represented the AHL franchise where he collected solid 161 points in 279 games. At the end of his contract he was traded to New Jersey Devils, but with no reached agreement at the start of the season 2011/12 he decided to play for HC Ambri-Piotta of the top Swiss league where he stayed until the end of the last season. He became one of the most popular players there and wore “A” on his chest in 2013/14. 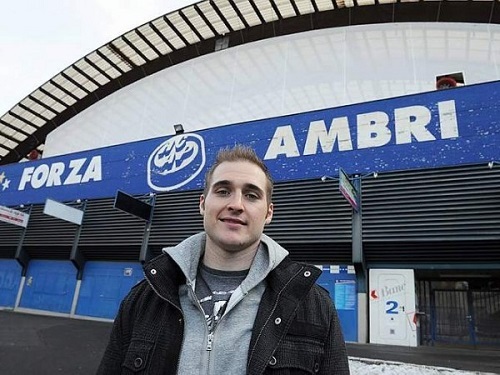 Management and coaches were satisfied with Noreau´s contribution and offered him three-year extension just few months after he played first games in Switzerland as a part of his first one-year contract. There is still one year left in his three-year contract, but HC Ambri-Piotta has allowed to him to left the team for his NHL experience. But if he decided to come back to Switzerland, the managers of the local team make themselves and himself sure he will wear the same jersey again and nothing different. 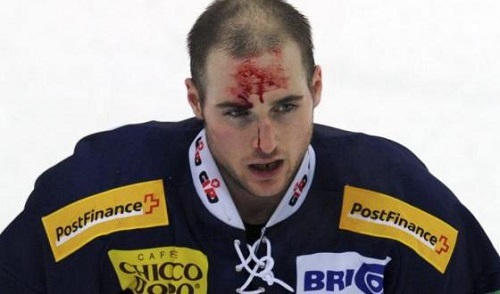 The Swiss team has already found a replacement for Noreau, when they signed former Avalanche defenseman Ryan O´Byrne for one year. Finally, Maxim´s international experience consists of the representing Team Canada two times at the Spengler Cup. The Avs have now 8 signed defenseman with one-way contracts, Tyson Barrie and Steffan Elliott are remaining unsigned. You spent the last three seasons playing in Switzerland for HC Ambri-Piotta. How has this experience changed your game and you as a player? I think I worked a lot on my skating, because the ice is obviously a little bit bigger there, so I did a lot of explosion and endurance stuff during the summers. I really focused on my legs, because the players are not as big and heavy. My skating has definitely improved a lot over the last three years, which I think is going to help me coming back here and playing against bigger guys. I think it’ll really help if I can out-skate them. I also had a bigger role over there, because you’re only allowed to have four imports on your team. It really helped me mature defensively. I had to go out and shut the other guys out, which was something my game lacked before I went over to Europe. Everyone said I could produce offensively, but that I needed to work on my defense. I think that really helped me mature and get better in my own zone. Why did you decide to leave North America for Europe three years ago? I had some really good years in the AHL and I felt I deserved to get a chance to prove myself in the NHL. Minnesota had a lot of good defensemen at the time and they chose to go with other guys, which is part of the business. Then they traded me to New Jersey. I couldn’t negotiate a good deal with my agent and New Jersey, so I decided I’d do it for my family money-wise and for the experience to go over to Europe. I got to travel a lot and I think it was the best thing for me to do. I was kind of fed up with being mad and stressed out about not getting a call-up while other guys got called up, which was really hard for me mentally. To go over for three years gave me a nice break. I know I’m a good player, I know a need to work on stuff, but I think I deserve a chance and hopefully I’ll get it with Colorado. Why did you choose Ambri-Piotta? There were a lot of good defensemen in Switzerland at the time. At some teams they liked to go with 4 forwards, a defenseman and a goalie and there weren’t that many teams. I signed for one year with them, because they needed a defenseman and it was really perfect for me. After two months, I played really well and got some offers. You know how it is in Europe that you could sign during the year for the year after. I got a lot of offers from teams in Switzerland because I was playing well, but I decided “Hey, you know, Ambri was good to me, they signed me, they brought me here,” and I really felt I was part of the team and the community, so I decided to sign with them for three years. Can you tell us more about the team and the city? I heard they are located in a small village and the stadium has no roof in some places, but the fans are very passionate. The two ends of the ring are open, so it’s really hard in the winter, because it’s like -10 degrees outside and to play on a Saturday night even with all the people generating heat inside it’s like zero degrees on your plate… It’s really tough to do and I was really happy that I was playing so much, because I didn’t have to sit to long on the bench. (laughs) The experience is great, the city’s very small, but it’s actually something very special to experience. I would drive to the rink on a Saturday night in the middle of winter and it’d be dead, like three hours before the game and there’d be nobody, no cars, nothing. Then I’d come out for warm-ups and there’d be 7000 fans. They would drive one or two hours every week to come watch us play. The fans very really great, they were great to me. They’d always wait for me after a game I played well when there was like -10 degrees outside. After I experienced this I was like you know what, I’m going to re-sign here. 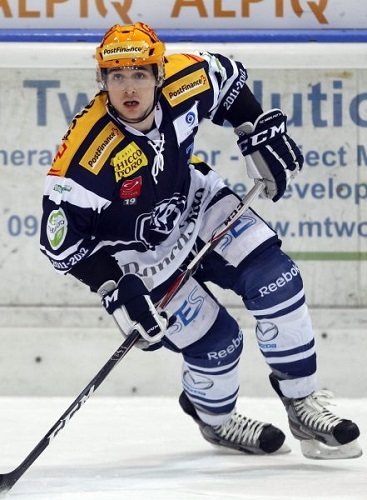 Matt Duchene played for Ambri-Piotta during the recent lockout and also appeared with you at the Spengler Cup tournament for Team Canada. How do you remember him? I called him when I signed (with the Avs) and I told him I was so happy to come back and hopefully play with him. I’m sure he’s going to help me out. He’s a great guy. In Europe, he showed our team what it is really like to be a NHL player. He’d show up at the rink ready to work out, to work on the ice every single day, because he kept saying “This is a big year for me,” and he really showed guys after the lockout. He came back after the lockout and I think he was one of the best players in the NHL that year. It was really great for our team to have a guy like that, who was really skilled and a really good person. He wouldn’t just wait and then show up for a game. He worked during the whole week. It was really great for a lot of the Swiss guys and for the younger guys on our team to see how hard you have to work to become that good of a player. Did you know about the Avalanche’s interest in you before, or was it kind of a surprise when they offered you a contract? I think my agent talked to them a little bit at the end of the year, not during the season. I’ll be honest with you, even last year I got some offers to sign here, to come back here and play, but it wasn’t the right fit so I decided to stay in Europe. On the Tuesday when I got the offer, on the 1st July, I said to my agent “They’re so young, they’re such a good team, they play so fast,” and that’s how I like to play, I like the quick transition game. I called Matt Duchene and he thought I’d be a good fit with the way I play, so hopefully I can prove to people that I deserve to play on this team. I’m not taking it for granted, as much as my contract is a two-year guaranteed, it’s a one-way, but I know there’s no guarantee and I just want to show up and prove that I can play. What does it mean to you to come back to the NHL, especially in an Avalanche jersey? It means everything to me, since Day 1. I got down here, I told the organization. I’m having a great time here, I love the city. My dream was always to come back, because deep down I just felt that I could play in the NHL. Maybe it was good for me to go to Europe and work on my game, so now I can come back and surprise some people, to make them think that maybe I can play in the NHL. Why do you think the Avalanche decided to give you a chance? You played in 6 NHL games and spent the last three years in Europe and now you got very good two-year, one-way contract. You had to impress them a lot at some occasion. I think when you look at my stats, every year I try to get better. From Juniors, to the AHL, to Europe, I get more comfortable, I get better, I get more confident. I work very hard of the ice. Honestly, I don’t know. I played a lot against some of the coaches; they know me from playing in the Juniors and they know what I can do. I really don’t know, but I’m obviously very happy to get a chance and to be given an opportunity for me to show up and prove that I can play. I honestly don’t have an answer for that. I’m not sure people saw me play in Europe. I’m really fed up with people saying that I’m a one-dimensional player, I’m just a power-play guy, because I was hitting guys in Europe, I was a leader, I was finishing plays, blocking shots and doing a lot of stuff and I think I can do a lot more than just that. I want to show people that they should’ve given me a chance before. Have you consulted your role on the team with someone from the Avalanche yet? If not, what do you expect? There are a lot of signed defensemen at the moment and the competition is going to be tough. I think it going to be tough anyway, because anywhere you go now, there are a lot of up-coming players and good young guys in the NHL. For me, I’m not looking at that too much. I’m just going to worry about myself and do whatever it takes to play in the NHL and see where I can play at this point. If they want me to hit, if they want me to be a player with a lot of energy, to just make it really hard on the other team I can do that, but for me, my main thing is that I’m good on the power-play and I’m very good at transitioning the puck quick and getting it back to the forward. 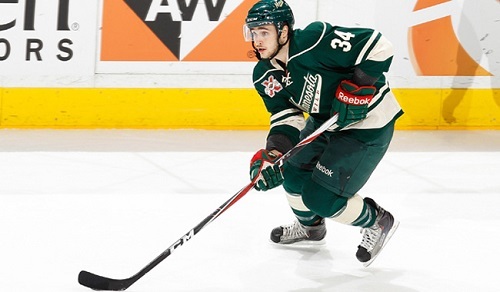 How do you remember your NHL experience with the Minnesota Wild? Also, you became a member of New Jersey Devils, but they didn´t give you a chance to play in games and let you go to Europe. Don’t you think both teams didn’t give you enough space to show your skills? I didn’t even show up in New Jersey, because I got traded in the summer and I didn’t even go and went straight to Europe. I didn’t really have that with that team. For Minnesota, I had some really good years there and the year I thought I’d finally get a chance they called up a lot of other guys that they have brought in because they changed management. I’m not making any excuses, they did really well last year and I really liked those guys they called up and they did well. It was just hard for me as a player to get a call-up only at the end of the year where I played 4 or 5 games when Minnesota was already out of the playoffs, and we were playing teams that were also out of the playoffs, which were playing with guys like me from the AHL. It was a little bit of a different feel. If I can show up and prove that I can start the year in Colorado, I think it’ll change the way I feel about the opportunity that I’m getting, that the team actually wants me to play. Playing the whole year in the AHL and then getting called up for the last two weeks is a little different for a player mentality-wise.